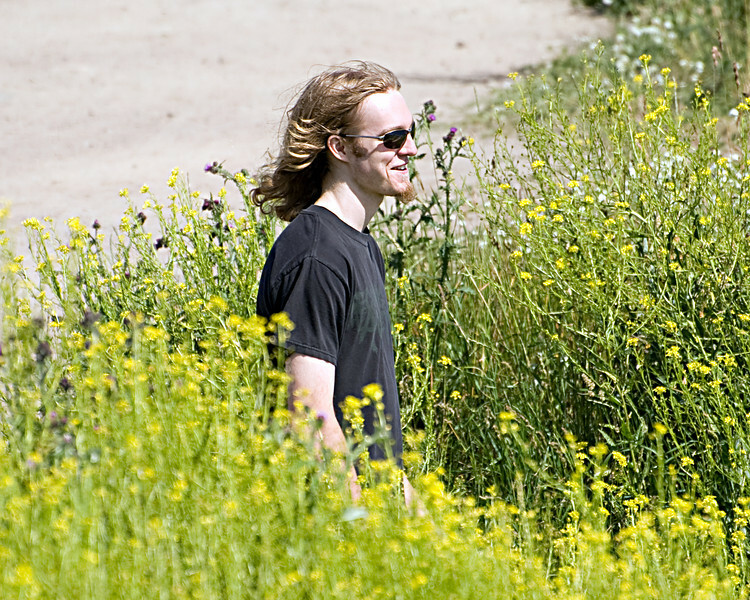 Here it is, the longest day of the year, the summer solstice. This map of Finland has been hanging on our kitchen wall since the shorter days of February, when Lisa, Ian and I began planning in earnest to visit this Baltic nation, home of, among other things, technology giant Nokia, nissua, reindeer, and of course, birthplace of the sauna (say "sow-na") . It is my hope to post a photo-a-day during our ten-day trip to Suomi, from whence came my maternal great-grandfather and great-grandmother. 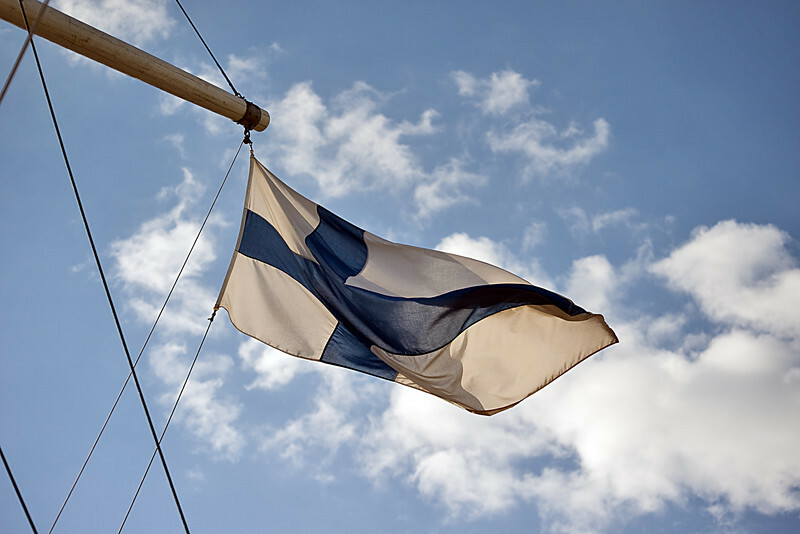 From a technological standpoint, Finland is one of the more well-connected countries, and I do not anticipate web access being a problem. Success with a daily post will more likely depend upon my own personal diligence. In a few days we will begin packing our bags. Plans are laid, the camera is at the ready, well-provisioned with extra memory cards and batteries. 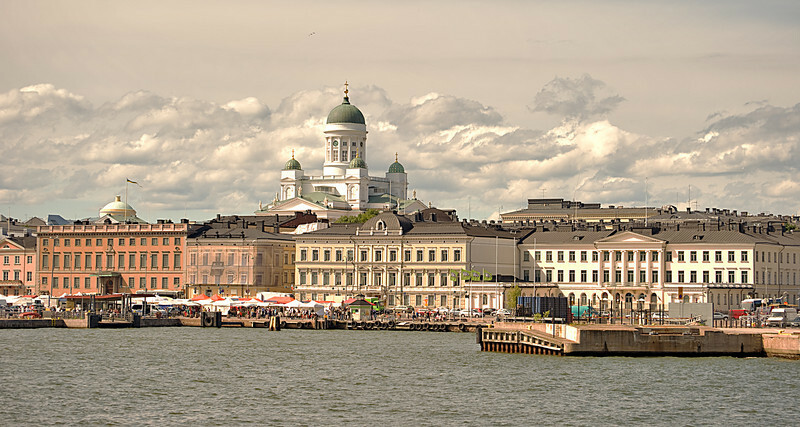 We depart on June 28th and if my diligence proves to be such, the next post to appear here will be from Helsinki on the 29th. Please feel free to follow us along and post comments if you wish. We have arrived. Touch down was approximately 11:40 AM Helsinki time. We are all crashing at the hotel after a grueling 14 hours or so. 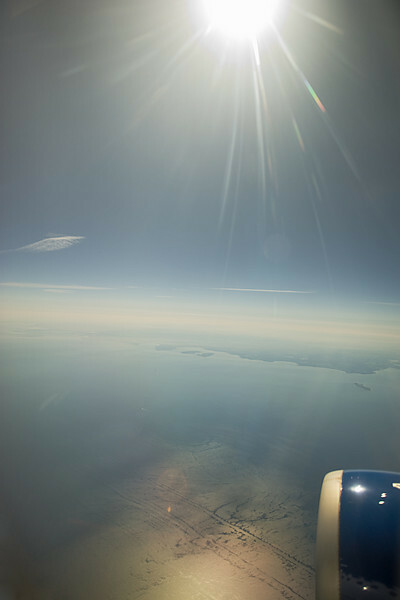 This is Finnair flight 3678 over the Baltic Sea, shortly before landing. Ground shots to follow. Have to lie down for a bit first. Breakfast in Finland - Score! I finally went to sleep around 4AM this morning...still working off the effects of jet lag. Six hours later, having slept through the hotel breakfast, I was on a mission. 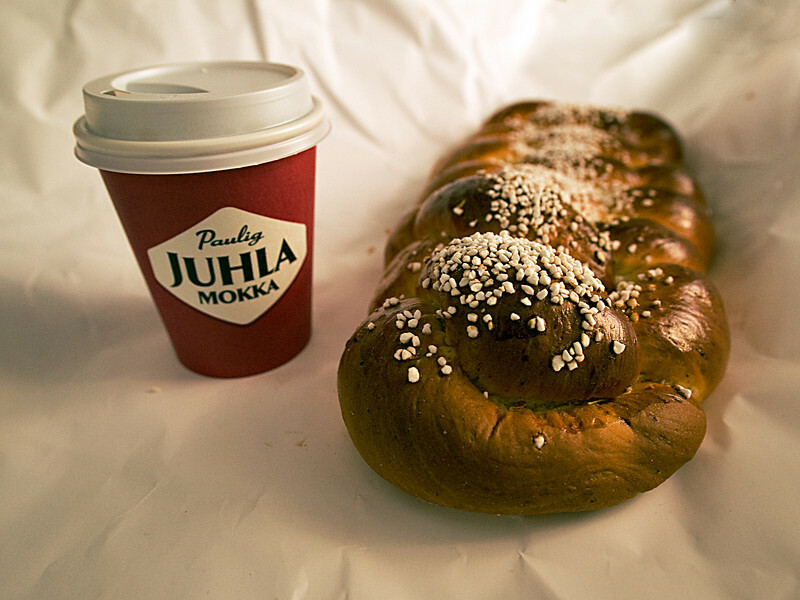 Fortunately right around the corner from Hotel Helka is a wonderful little leipomo - bakery, offering "Khavi & Pulla" for 2.50. Five euros scored me a loaf of the most beautiful pulla I think I've ever seen. Of course I know it as Nisu. It was good. Ready now to venture out to meet the city of Helsinki. Yesterday we strolled through Esplanadi Park and on to the Kauppatori (outdoor market place). I was told that Finland is a land of beautiful women and it's true. One of them, the ever present Havis Amanda, is situated between the park and the Kauppatori. Of course, I think she could do without the seagull perched atop her head, but haven't the time to edit it. Perhaps a later revision is in order. Bonus photo day! 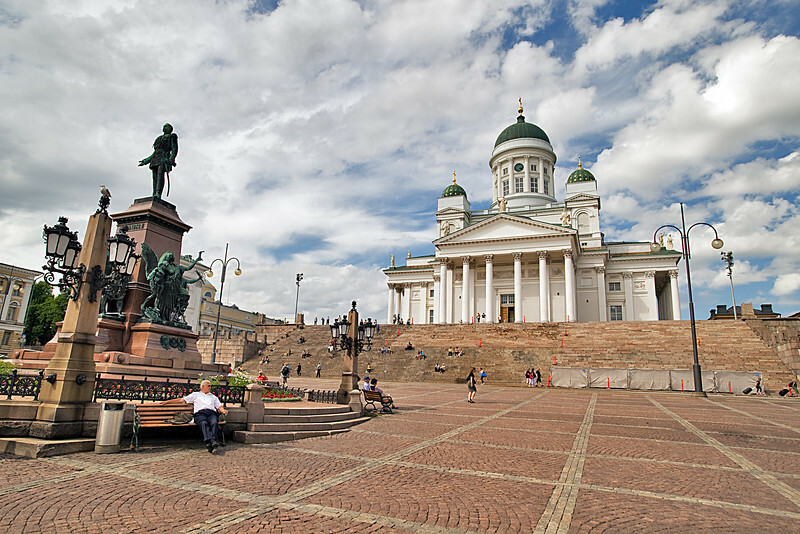 Just a block up from the Kauppatori is Senate Square, with a statue of Alexander II and the impressive Lutheran Cathedral dominating from the rear. Today we are off to a hotel breakfast, then the ferry to Suomenlinna. Today's postings are early since tomorrow is a travel day. Helsinki is a wonderful city, friendly, beautiful parks, impeccably clean, bustling in an un-frenetic sort of way. Two days does not begin to do justice to her many old and new world charms. We are off to Turku by rail in the morning. Love reading all your comments, please keep them coming! Note to Eunice - I'm sure the Nisu your Mom makes is as good as it gets. Yours too Mary. Finns love bikes, dogs, coffee, bikes, ice cream, bikes - what a great place for some candid street shots. I sat at an outdoor cafe sipping iced coffee, watching Finns with bikes, Finns with dogs, Finns with coffee, Finns with ice cream... you get the idea. Yes, I have lots and lots of bike photos. Later. Note to Keith - thanks again for the generous use of your netbook. It's doing the job just fine and so much more portable than my notebook. Time for a quick post today after all. 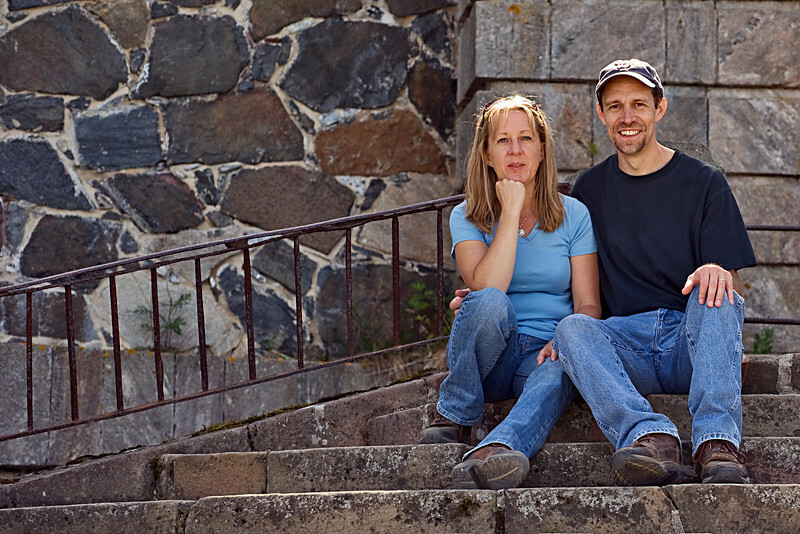 This is from our trip to Suomenlinna yesterday. I believe I have the translation correct: susi - wolf, saari - island. Lovely place indeed. Another day-early post since tomorrow, Saturday, is another travel day. We arrived in the city of Turku (say: toor-koo - roll the R if you can) this afternoon after a two hour train ride through some lovely Finnish farmland. 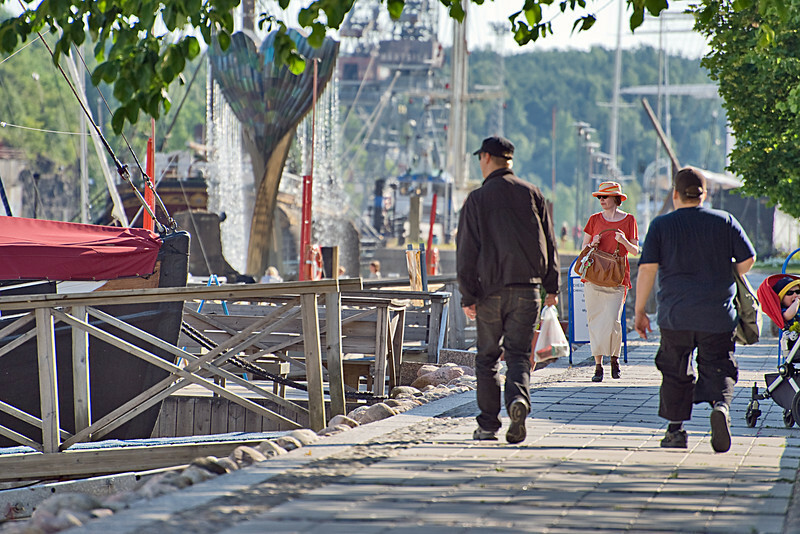 At pop 175K, Turku is quieter and more relaxed than Helsinki. A visit to Turku Castle, followed by some of the absolute best pizza I've ever had and we're ready to hit the rail tomorrow morning, northbound for Oulu. A quick observation regarding food. We ordered two pizzas for the three of us, contrary to the advice of our Finnish waitress, who felt that two just wouldn't be enough. She was a bit surprised when we couldn't eat it all. Finns eat a lot, but are noticeably thin and fit. Must be all that bike riding. Note to Matt: Ian and I have eaten lots of excellent salmon. Ian had some reindeer last evening and gave it thumbs up. 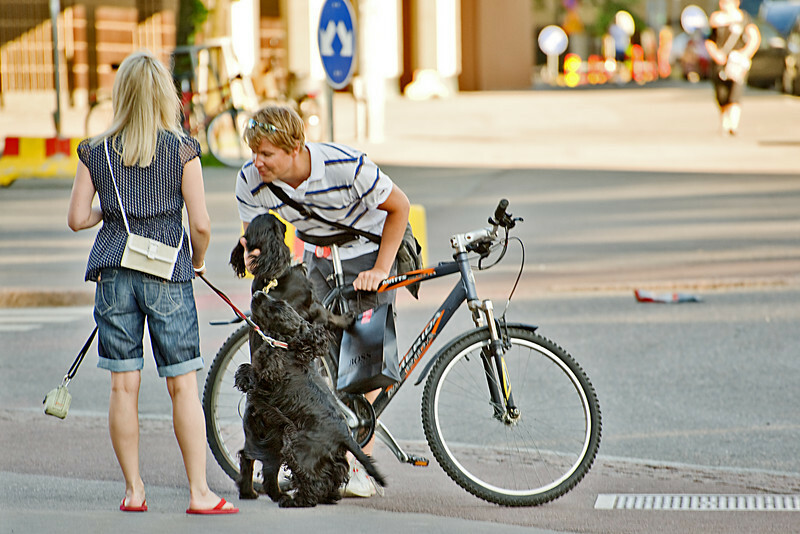 By Request: The Two Bike-Riding, Coffee-Sipping, Ice Cream-Eating Dogs of Helsinki. Here you go Keith. I came across these dogs just after they had each finished eating a vanilja eskimo bar at one of the many stands dotting the city. The girl let them finish her large cup of Paulig Mokka khavia while the guy here is holding the bike steady for them while they get on. Ok, so they weren't doing it all at once, but I think they deserve points nevertheless. Oh, I would have photographed them actually riding the bike but I was suddenly distracted by a loaf of pulla from a nearby leipomo. Happy Fourth to all you stateside! We arrived in Oulu yesterday around 5:15 PM by Rail Europe. 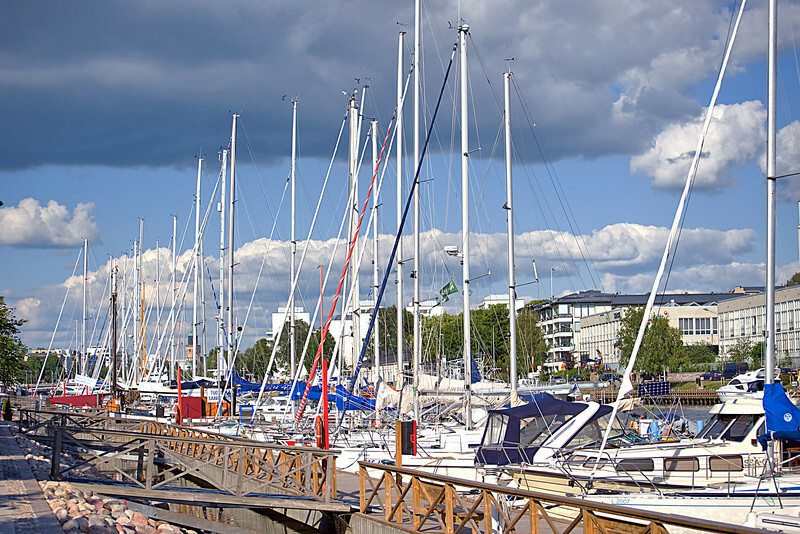 We find ourselves wishing that we had more time in the city of Turku as it seems quite nice, set on the banks of the Aurajoki. There is a nice walkway along the river, as seen here. Our stay in Turku was brief but pleasant. The weather could not be better, sunny and mid 70's - prime time Finnish summer and, brief as it is, the Finns don't waste it. Bikes and boats are everywhere. The 7+ hour train ride to Oulu on Saturday proved restful after five days of activity. Urban sprawl does not seem to exist in Finland and after changing trains at Tampere, the second largest city, scenes like this were pretty much the norm. On a side note, the train made a stop in the rural township of Kauhava, which is where my Great-Grandfather came from. I took a picture of the station to bring home with us. 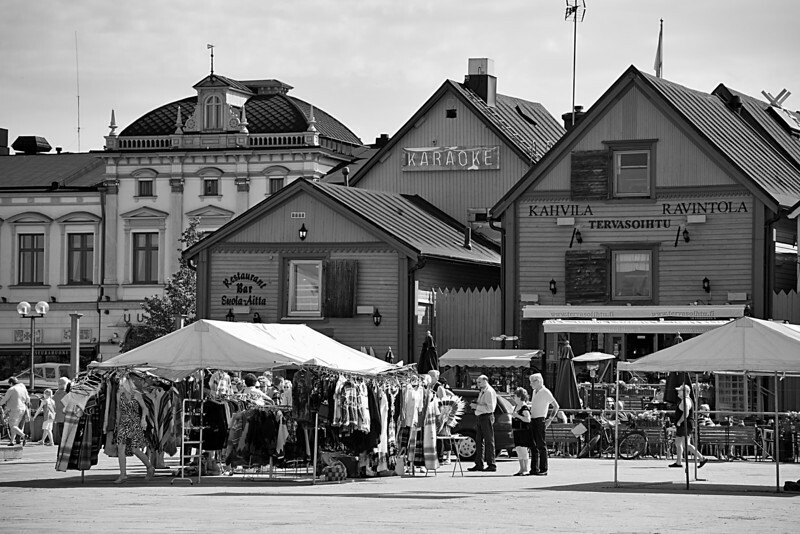 We spent a restful Fourth of July in Oulu, the sixth largest city in Finland. 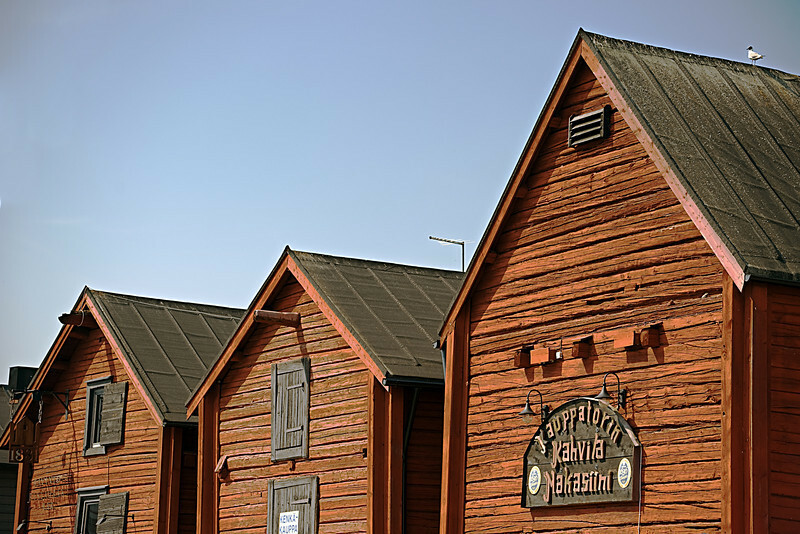 No Stars & Stripes were in evidence, but I did find some red, wooden storehouses set against a blue sky at the Kauppatori. Later, the day found us at Cafe Bisketti, THE place to go in Oulu for khavia, wonderful pastry and people-watching from the outside seating. In fact, we went twice. 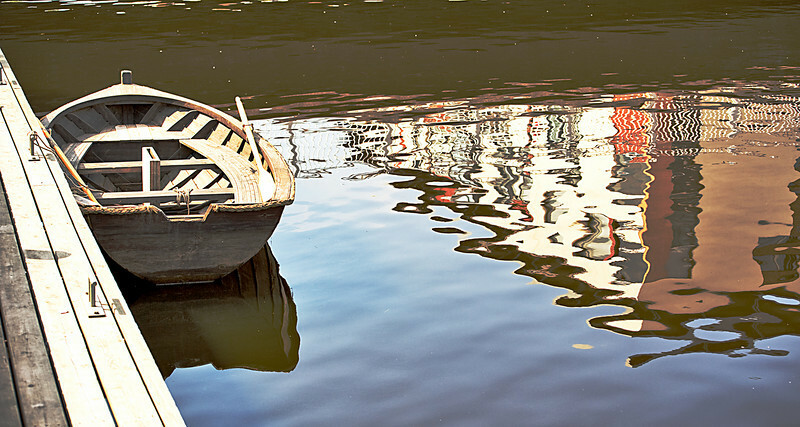 A restful scene from the Oulu waterfront. 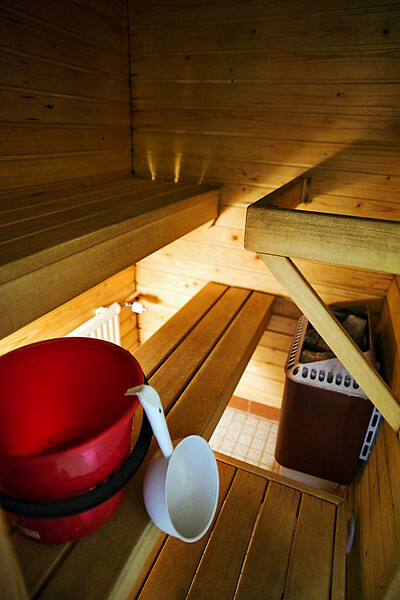 The sauna is a Finnish invention. As a kid I remember going to Uncle Matti's wood-fired sauna in New Hampshire. Turns out that our room at the Apollo Hotel in Oulu comes with one, albeit electric. What the sauna did was to sweat out the sore throat, stuffed sinuses and chest congestion that have been dogging me since Wednesday. No wonder almost every household in Finland has one. 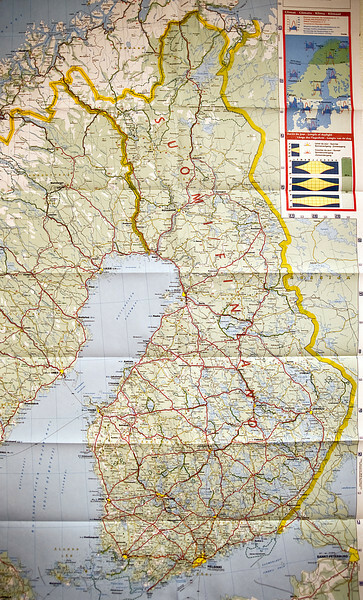 Tomorrow we are off to Rovaniemi and the Arctic Circle. 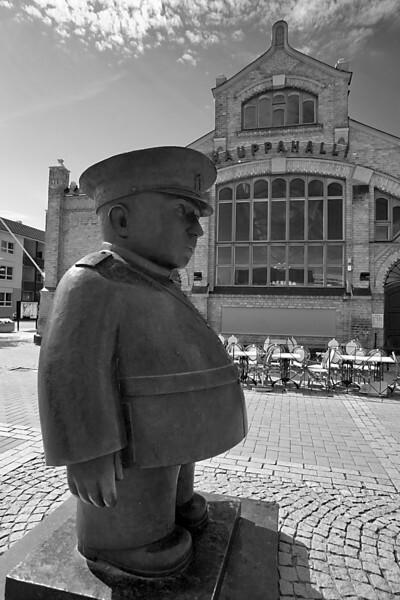 The portly Market Policeman stands diligently at the entrance of the kauppatori, casting a watchful eye over all entering and departing. I'm not aware of any meaning or significance to this statue, or if it represents an actual person - haven't had time to research it yet. But judging from his substantial girth, I suspect he spends his off time at Bisketti's, sampling the large variety of pulla and pastry. I think we'd get along just fine, he and I.
Oulu's kauppatori is considered one of the best in Finland. We visited on a Sunday which apparently is an off-day. But there were still some vendors set up selling produce, t-shirts, belts, etc. Yesterday morning (Sunday) from the Hotel Apollo. The window blinds were sandwiched between panes of glass, so I just went with it. We actually left Oulu today and arrived in Rovaniemi on the arctic circle around 3PM. Haven't had a chance to explore here much, (too busy eating sauteed reindeer and lingonberry at the wonderful hotel ravintola) but the train ride provided some down time to process images from Oulu. 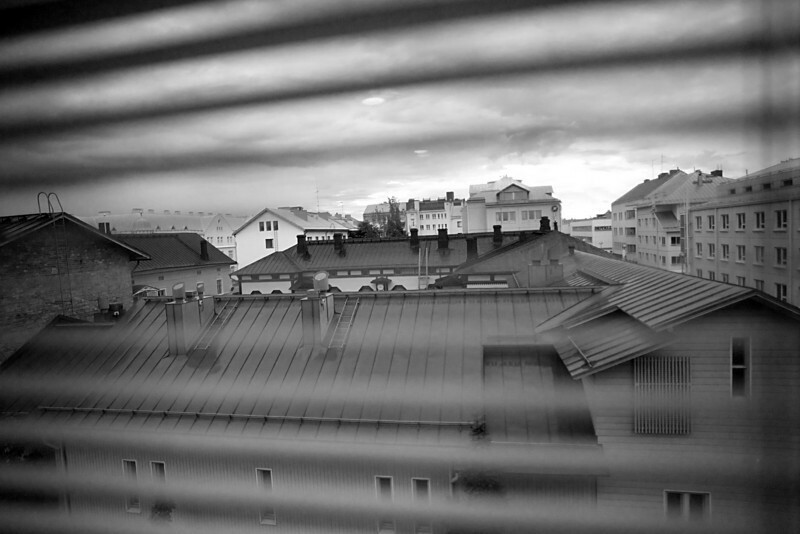 So today I am posting a black & white series on the city of Oulu. Happy 18th to Ian ! We celebrated Ian's 18th birthday in Lapland - Rovaniemi, Finland, on the Arctic Circle. He hates having his picture taken, but I did anyway. Even got a smile in the effort, though he was trying not to. 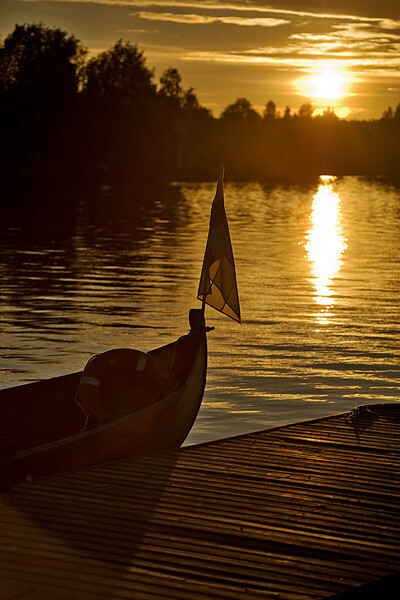 In the evening (9 PM) we went for a ride on the Kemijoki in a traditional Finnish longboat. Later, on a little island in the river, our guide prepared a traditional Finnish dinner of flatbread, broiled whitefish and veggies, followed by dessert with Finnish coffee that makes Starbucks seem weak and watery in comparison - really. 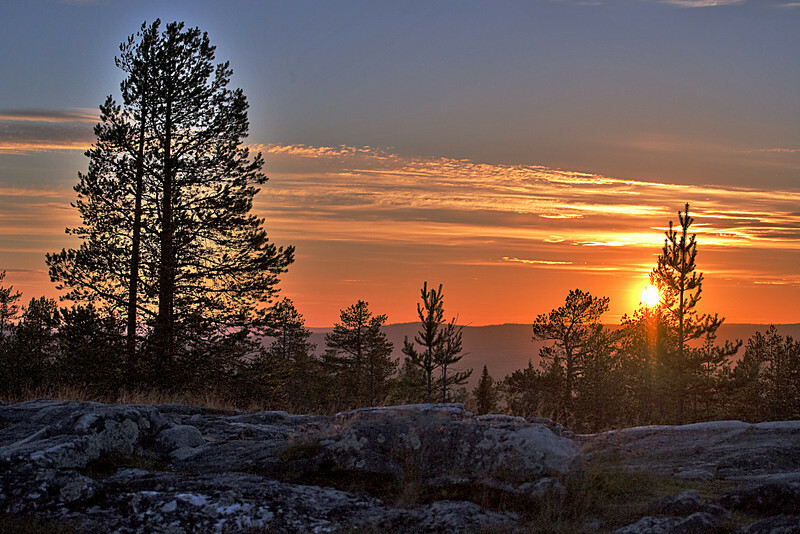 Midnight found us on top of a hill experiencing the Finnish White Night - when the sun does not set, but hangs on the horizon. 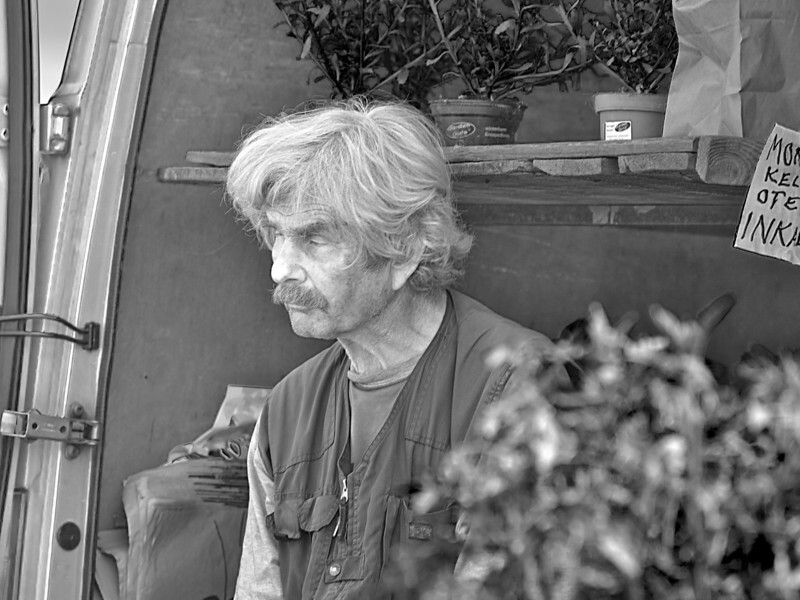 Today will likely be my last post from Finland, so I am posting a number of various, random shots. 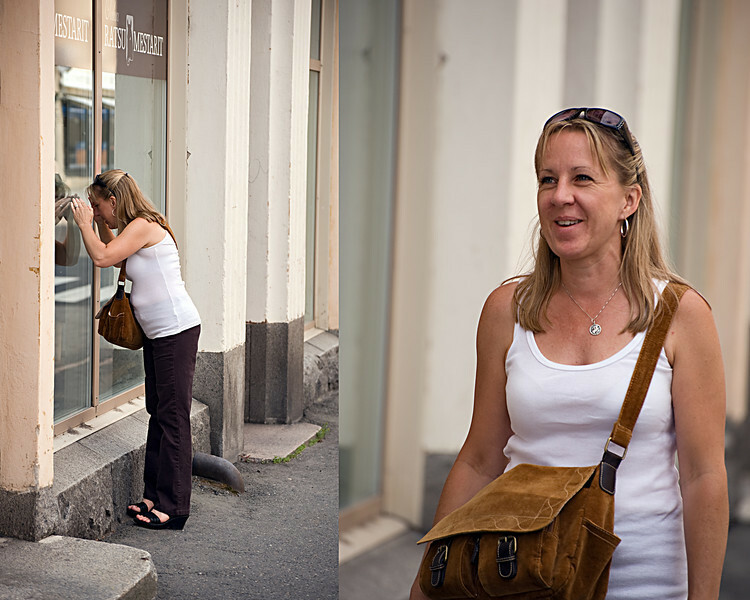 Lisa doing some window shopping in Oulu last weekend. 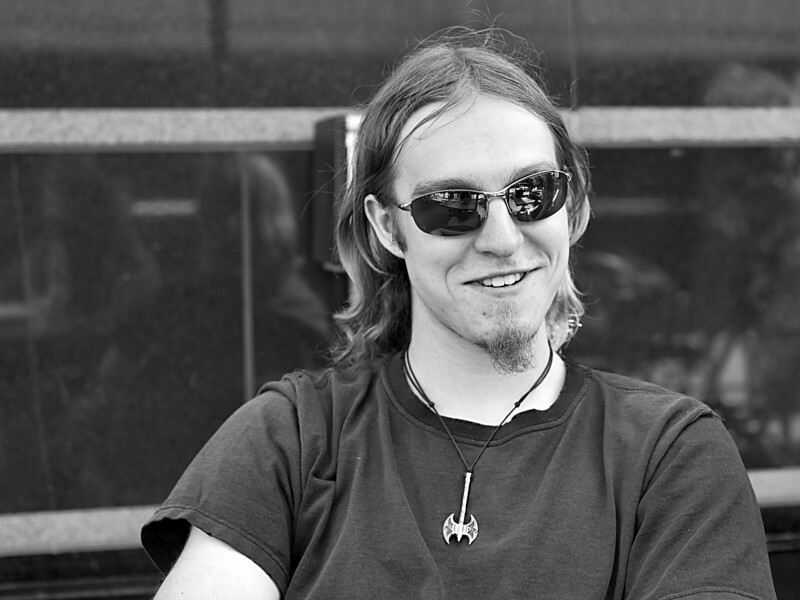 Ian finds something humorous while at the Gulf of Finland. For you, my Dear Niece, as promised, this Upcider is in your honor. 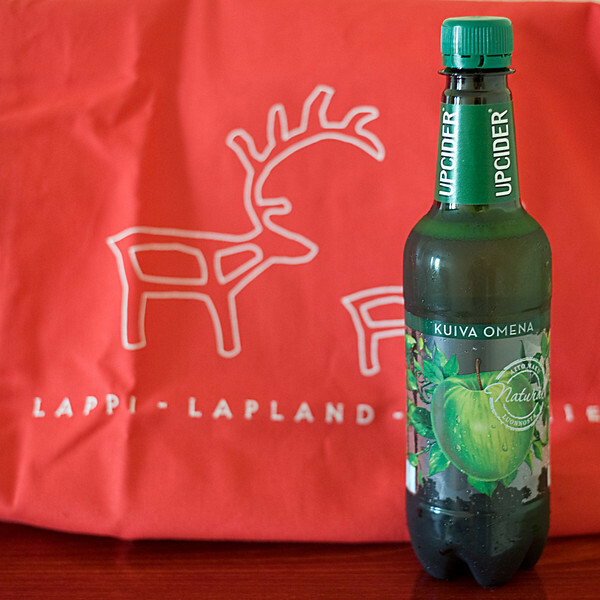 Upcider is only available in Finland and other participating countries, which, much to her dismay, does not include the United States of America. 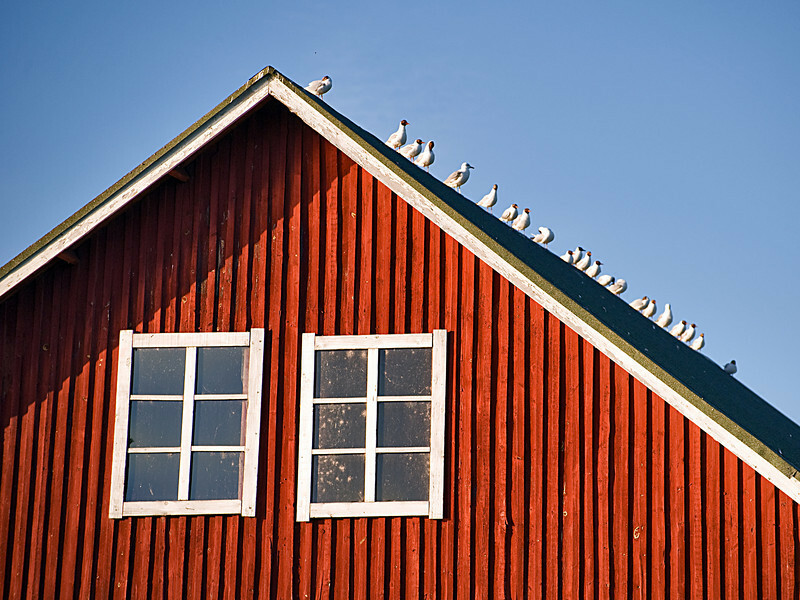 Gulls line the peak of a Finnish Barn on the Kemijoki, Rovaniemi, Finland. 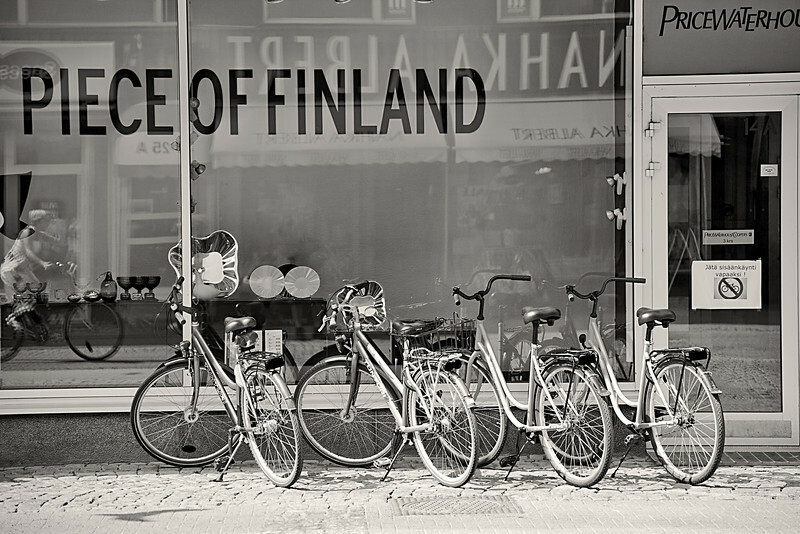 I've said it before: Finns love bikes! I couldn't resist one last post before we pack up today. 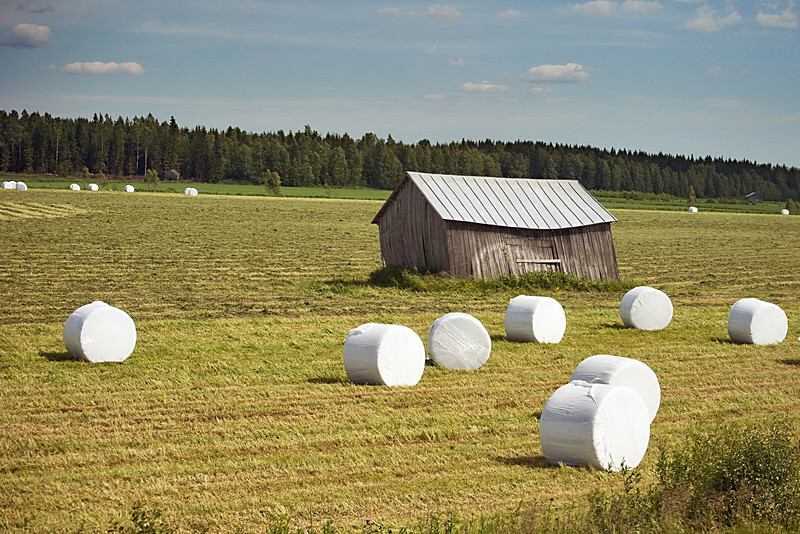 Finland is a rural country, full of great photo opportunities. 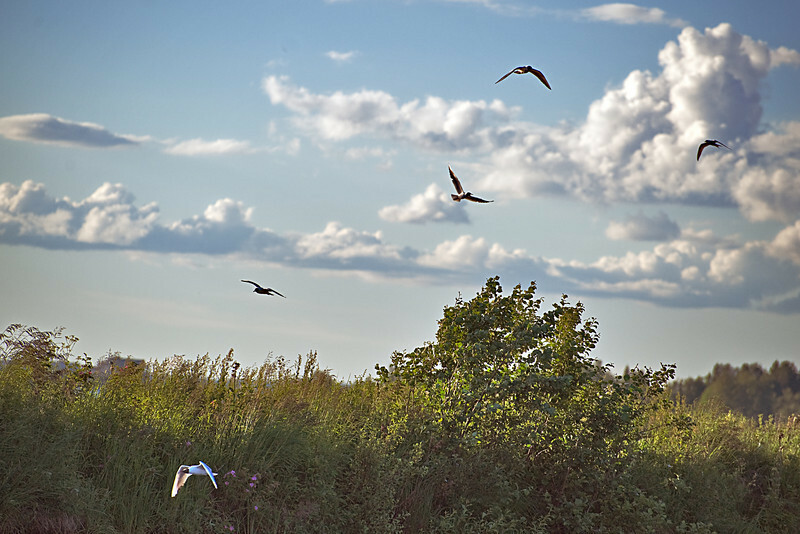 While we were mainly in the cities - Helsinki, Turku, Oulu and Rovaniemi - nature is never far away. Neither are bikes, coffee, dogs, ice cream, saunas, oh, did I mention cell phones...? Re-entry...we are back stateside as of very early Friday morning, sleeping, doing laundry, re-adjusting to darkness, etc. I would like to say Thank You to Claire Van Wely of Milne Travel in Keene, NH for putting this trip together for us. Having never traveled overseas before, we needed lots of help and Claire took great care of us. So, if you are planning a trip, and I think you should, go see Claire, she's wonderful to work with. Just do it. 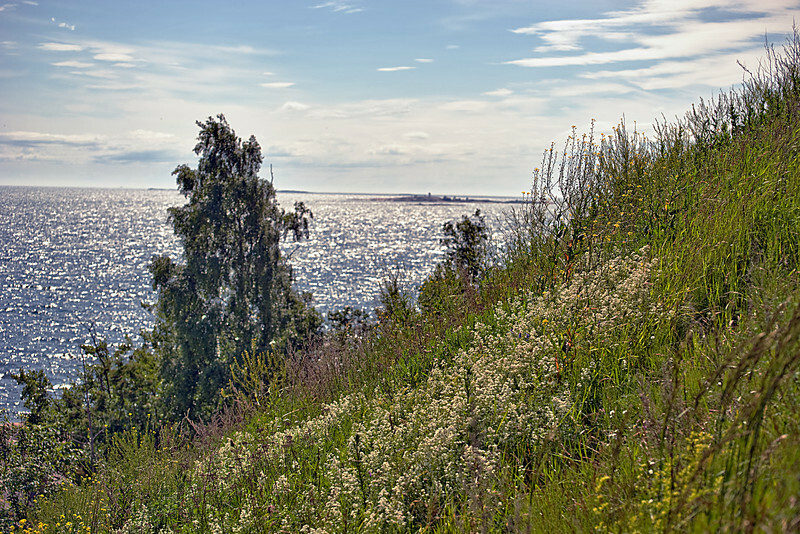 This panorama of Suomenlinna Sea Fortress will serve as punctation on this travel blog, which, I hope you have found enjoyable. This image is best viewed at X2 size. 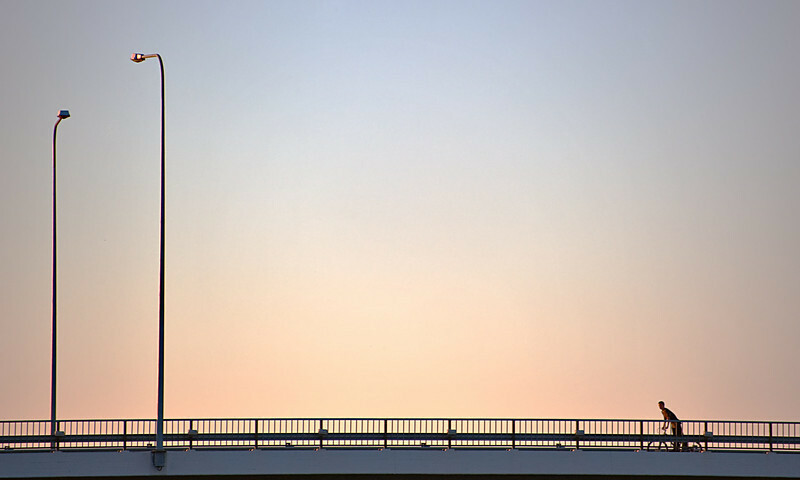 Please stay tuned for the full image gallery, coming - maybe soon..
Siihen asti, kunnes me tapaamme jälleen, Suomi.